Last year my husband had a cycling accident and ended up with some fractured ribs and a bruised liver. There is very little that medical professionals can do in this situation, other than diagnose the problem and provide pharmaceutical pain relief. The body will heal itself, aided by rest and time, with possibly some ice or heat applied to the injured area. In the short list of recommendations from the physician, nothing was mentioned about diet. This surprises me since the liver is an organ that can be greatly affected by what we eat and drink, and because healing, in general, can be helped or hindered by food choices that we make during the process. Our bodies are continually repairing and rebuilding, but an injury puts an extra load on the system. You probably know that the liver is that large organ that is located in the upper right section of the abdominal cavity, partially tucked up under your lowest ribs and next to the diaphragm. Most of the time you don’t even notice that it is there, but if it is not functioning properly due to disease or injury, you will soon become aware of its importance in helping you to feel good and be healthy. (1 ) Maintain normal blood sugar levels by storing extra glucose when blood sugar levels are high and by changing stored glucose to its usable form and releasing it into the bloodstream, when blood sugar levels are too low. It can also convert fat and protein to glucose. Example: When you exercise or work hard, the glucose in your blood that is needed by your cells for energy is quickly depleted. The liver responds to signals from hormones, and changes some of its stored energy into a usable glucose and releases it into your bloodstream, so that you can keep going. This is a simplistic explanation of a very complex process, but you get the idea. (2) Controls fat metabolism by removing fats from the blood and converting one kind of fat into another and converting some carbs and proteins to fat. Example: When you eat a meal, there will be some fat in the food you choose. When it is digested, the fat will circulate in your bloodstream where it can be picked up by your liver to be converted to a form that your body needs for a variety of functions. (3) Helps metabolize protein by removing nitrogen from amino acids, forming waste products that can be excreted by the kidneys, creating certain plasma proteins such as those used for blood clotting, and changing one amino acid to another. Example: When you eat a steak, your body may not need all of that protein to build new tissues, etc. The liver can help by removing the nitrogen component of the protein, so that the remaining portion can be used to provide energy. (4) Acts as a storage facility for glycogen (storage form of blood sugar), Vitamin D, Vitamin A, Vitamin B12, and iron. The liver can also store several hundred milliliters of extra blood for use if needed by the body. Example: It’s been cloudy and cold for a few days, and you haven’t had a chance to get any sunshine. The Vitamin D levels in your blood drop below normal and your liver releases some of the Vitamin D into your bloodstream, so that you can continue to enjoy the advantages of optimum Vitamin D levels in your blood. (5) Filters and detoxes the blood by removing damaged red blood cells and toxins such as alcohol and other chemicals. Example: If you drink alcohol, the liver can remove it from your blood and metabolize it before the levels become toxic enough to kill you. However, if you outrun your liver by drinking too much too quickly, you can die from alcohol poisoning. You may have heard about cases where a college student succumbs to alcohol toxicity during a drinking game or hazing event. (6) Aids digestion by secreting bile that is stored in the gallbladder and sent to the digestive tract (duodenum) to help digestive enzymes and the absorption of fats and fat-soluble vitamins. Example: When you eat bacon and eggs for breakfast, your liver will secrete the bile necessary to emulsify the fat so that it can be easily digested. At the same time the bile facilitates the absorption of the fat-soluble Vitamin A and Vitamin D from the eggs. After the accident, I did some research on what we can do, with regard to diet, to help support the liver and maybe shorten the healing time. Although our bodies are marvelous organisms, with an amazing ability for regeneration, there are some ways we can improve our diet to help maintain a healthy liver. You will also find that many of these guidelines are useful for anyone who wants to improve their general health. -Limit or avoid alcohol since your liver has to metabolize it and may be overloaded in that process and unable to perform its other functions well. -Avoid processed foods, especially those with high fructose corn syrup, a portion of which must be metabolized by the liver and if consumed in excess, can lead to a fatty liver. -Limit fats, particularly deep-fried foods and hydrogenated oils, which place a burden on the liver. Choose low-fat versions of dairy products or eat full-fat versions sparingly. 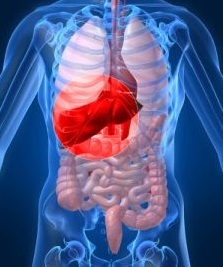 -Eat organic foods, whenever possible, to reduce the detoxification work of the liver. If you can’t eat all organic, the most important foods to buy organic are meat, eggs, butter and cheese, where the toxins are more concentrated. -Eat lots of fruits and vegetables for their fiber, vitamins, minerals and phytonutrients that are needed by the liver to perform its important functions. -Avoid cured and smoked foods, and other foods high in salt. -Maintain a healthy weight, since excess weight puts an unnecessary load on your liver and gallbladder. Combine ingredients in a saucepan and simmer for a couple of minutes. Turn down heat and let step for about 15 minutes. Strain and drink at least a cup a day. -Add some turmeric to your diet, since it has been shown to improve a sluggish flow of bile and thus aid digestion. -Try some ginger in your diet to aid digestion, which helps the liver. 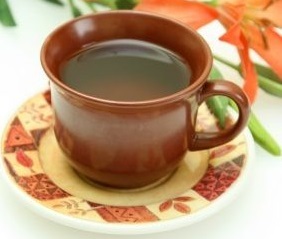 -Drink some chamomile tea for its digestive healing properties. -Brew some green tea for its ability to help keep toxins from damaging your healthy liver. -Eat sulfur foods such as broccoli, cauliflower, Brussels sprouts, onions, garlic and egg yolks (in moderation), which help the liver perform its detoxification function. -Use milk thistle to help detoxify the liver. You can buy the seeds and grind them or make tea, or you can use an extract in supplement form. My husband mended over time and soon was able to resume some of his normal activities. He is so active by nature, that I had to practically tie him down to get him to rest and allow his body to heal itself. It is my hope that some of the things he learned about ways to keep a healthy liver will continue to be applied long after he is back on his bicycle, risking life and limb--or should I say life and liver—for the sheer joy of the sport. Click here to go from Healthy Liver page to 10 Tips to Healthy Eating page.